I sew and I talk about it. Last summer, I bought Rae's Washi Dress pattern, printed it, and never thought about it much. I adored every one that I saw on Instagram and after six months (and leaving QuiltCon ready to sew), I declared that Wednesdays in March would be "Washi Wednesday." As I prepped the PDF pattern, I thought that I could not handle waiting that long (over four weeks) to make dresses. My next thought was "Washi Week" and that is what I did, all week, I made Washi dresses. I could get to almost an entire dress in the time I was allowed each day, the hem was always unfinished and some days, the arms were incomplete. At the end of 5 days, I finished 3 Washi dresses and 1 Washi top! The next week was spring break and I did not do a damn thing. I was able to squeeze in one more dress (cream w/blue trees) at the end of the week 3, it was a busy time as I volunteered half days to 6 elementary students who learned to sew. After that, I made a matching dress for my little. And maybe you didn't know this about me, but, I could not stop making these dresses, so I challenged myself to crank out 2 more before the month ended. I was able to finish them with a day to spare! Luckily, it was Cesar Chavez Day, so I didn't have time to sew anymore. I really love this pattern, most of them are made differently--some have pockets, some do not, one has sleeves, 2 are tops, one has a full bodice lining, and one has neck/back facings machine stitched in place. Yes, I am making more tops (waiting for Tsuru) to coordinate with some pants that I recently purchased. You can purchase the Washi Dress pattern on Rae's site. Thank you! I'll post pics as I wear them with a little more detail. Wow, this is amazing. I really want to sew up this pattern! That is awesome! I love my washi tunic and can't wait to make more once my babies born. Love all the fabrics you choose. wow! they all look fantastic, what a great summer wardrobe. Can you tell me the name of the cream fabric you used in that last dress? Thanks. I love them all!!! Do you mind telling me where you got the fabric for the one alle the way to the right? Thank you! That fabric with the blue trees is in the Mecca for Moderns line by Alexander Henry Fabrics. 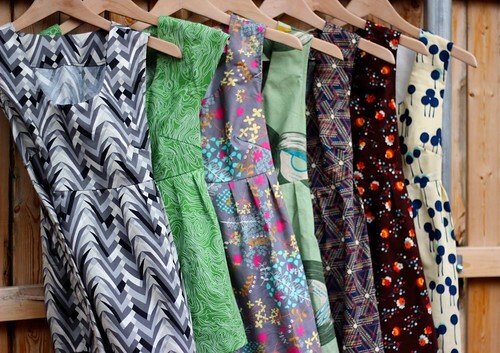 I have updated the blog post with dress fabrics, the one you asked about is a print from Washi by Rashida Coleman-Hale. Cheryl Arkison: I just finished my Quilt Con quilt top too.